I arrived in Paris on Friday evening but was inside for the night before the murders began. Over the next month Buzz Tour will be reporting from Paris, bringing you interviews and articles about the people gathering to work to reduce climate change, but in this first report can only express my condolences to all those injured and those who lost loved ones. On Saturday I saw soldiers outside a synagogue and assumed it was because of the killings but my companion told me that Parisians have been living with soldiers outside some places of worship and schools since last January’s terrorist attack. I spent today walking from one side of Paris to the other today then catching the buses around. In the unseasonably hot, sunny weather people went about their Sunday business and the street cafes were busy. Tourists packed the areas around famous sites and families were using the many parks. Opposite the Porte Saint-Denis (built to celebrate Louis XIV’s war victories) a homemade banner call for “Paix Amour” – Peace Love – with the Eiffel Tower peace symbol. 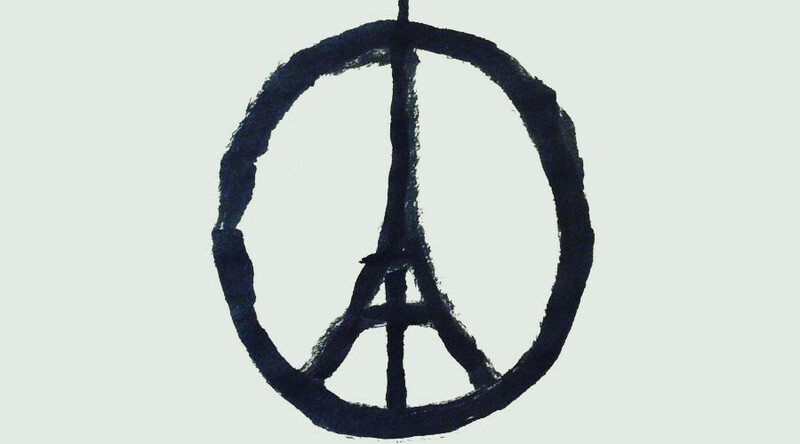 The Eiffel peace symbol was also showing on electronic screens in the spotlessly clean business district amongst the glass high-rise towers. The number of homeless people living in poverty on the streets across the rest of the city is very high, most of them black. Cardboard corrals and tent shanty areas pop up now and then anywhere, even next to the Commerce building. Hundreds gathered in Place de la Republique for a peace vigil this evening. Looking out of my window I can see the Eiffel Tower in the distance, tonight relit after being dark in mourning yesterday. What’s happening at the COP21?